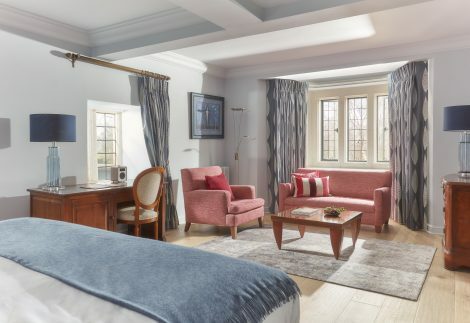 Superior rooms provide the perfect accommodation for luxury Cotswold breaks, so you can discover the Cotswolds in your own time. Located in the main part of a five-star hotel, each room has a unique interior design with space to relax and unwind. Featuring a super-king size bed, handmade in Yorkshire by Harrison Spinks. The thousands of pocket springs also ensure the most comfortable experience. Every Superior room has a luxurious bathroom with heated floors and indulgent amenities from Molton Brown. Lots of delicious treats are waiting in your room for you. Homemade biscuits & elderflower cordial, still and sparkling mineral water, Whatley Manor chocolate bar, coffee and tea making facilities. Every room benefits from efficient WiFi and our chrome cast TV’s allow you to stream directly from your own devices. One of our superior rooms is dog friendly. Book directly with us and we will guarantee to save you money!